So much for that early October shipment date Grove teased us back in September! But no complaints here; we finally got our hands on the latest handcrafted case for the iPhone 5 and it’s already gearing up to be one of the more unique cases available out there. But is it worth the $80 price tag? Here’s your first look at the finished product. Based in Portland, Grove is known for creating handmade, organic products while maintaining a low carbon footprint – down to the recycled cardboard packaging. When we popped the case out of its wrapper, we immediately clamored on the quality feel and artfully designed structure. 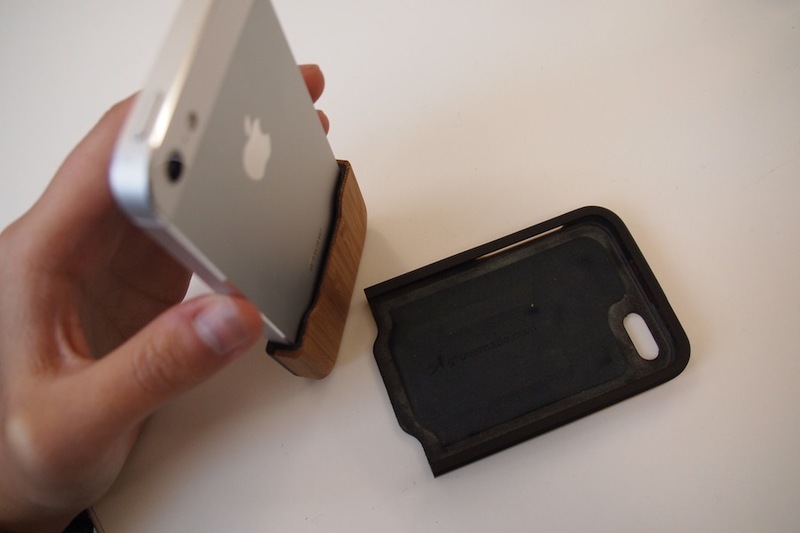 The Grove iPhone 5 bamboo case breaks into two pieces, a lower and upper component, so you can slide your phone within the case. The inside of the case has a nice padding to keep your phone’s metal back scratch-proof. 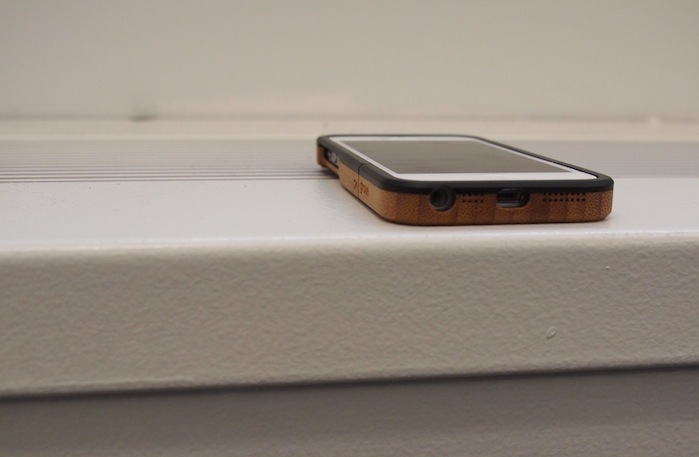 With the case on, the iPhone 5 gains about one-third inches in width, which makes it almost as wide as a Samsung Galaxy S3. The phone also gets an added weight that feels more secure, because the iPhone 5 is so strangely light that we thought it was going to fly off our hands if we’re not careful. One thing we enjoy is the limited branding on the side of the case. 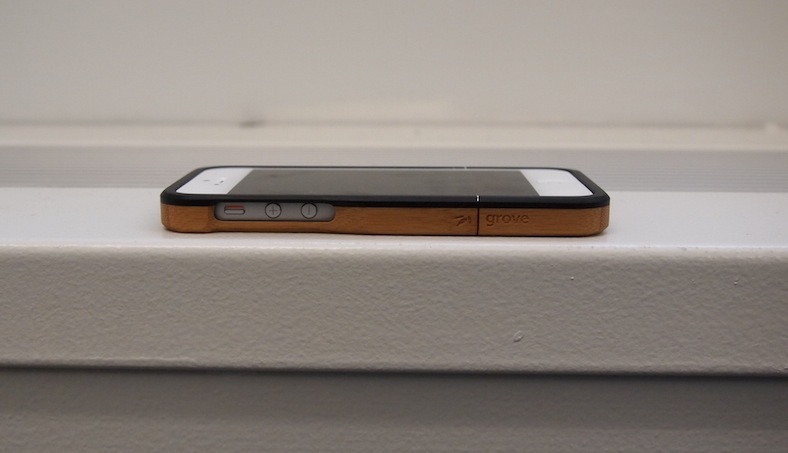 We’ve seen phone cases with obnoxiously large logos slapped on the back, and it’s nice for Grove to monetize on being one of the premiere brands to use wood, and stick the little logo where it’s still seen but not in-your-face. 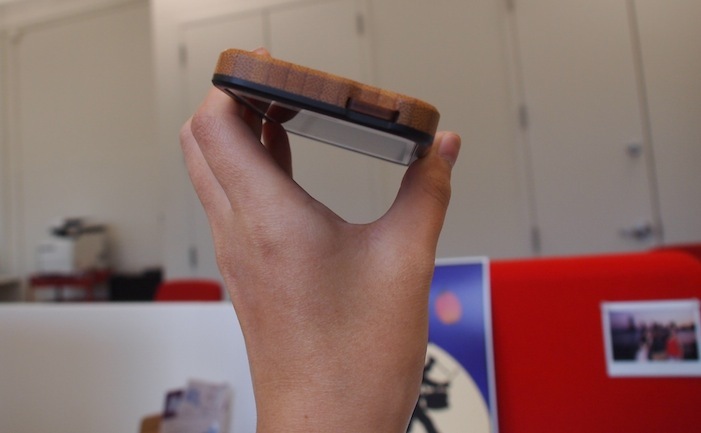 Although wood is certainly a sturdy material, small portions tend to make for a rather brittle phone case. Thankfully, with the padding inside Grove’s iPhone 5 case, the product is tough against scratches and light drops. But even the company admits the bamboo cases are not drop proof, and strong impact will damage the case. If you’re choosing to buy Grove’s case, you probably value look a bit more than protection, or want a happy compromise on both. One cool design component is the bamboo Sleep/Wake button that sits right on top of the iPhone’s original placement. It’s a neat way to make your case look cohesive, while protecting the button from dust and grime. The wooden overlay is supremely responsive despite the extra width, which is always appreciated. 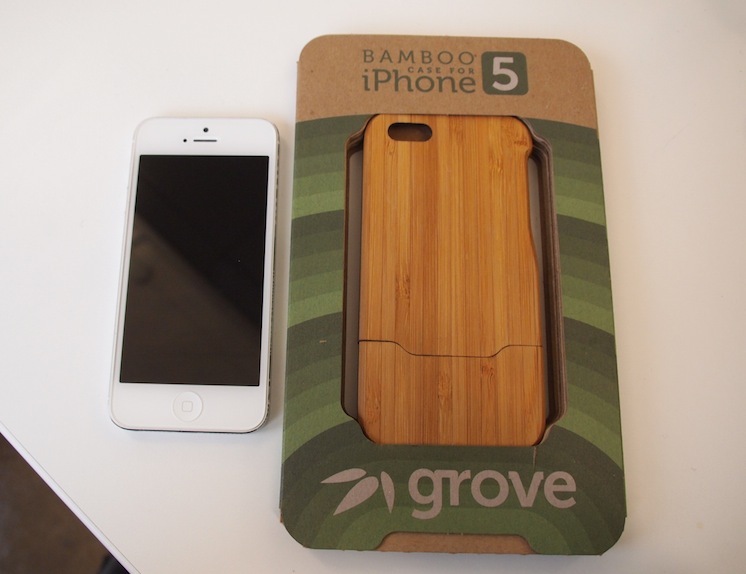 While the Grove bamboo case adds a stylish and rustic touch to your iPhone 5, it does come with small complications. For one, the two-component design makes it prone for the case to slip off when you pull the phone out of your skinny jeans (sorry for being so fashionable here, guys). Secondly, while the design does boast Lightning access, kiss goodbye to your 30-pin adapters. Those babies are blockaded entirely, so unless you already have a new speaker dock with Lightning pins, you’ll have to remove the case before attachment. Removing the case only takes three seconds, but shortcuts would have been nice. 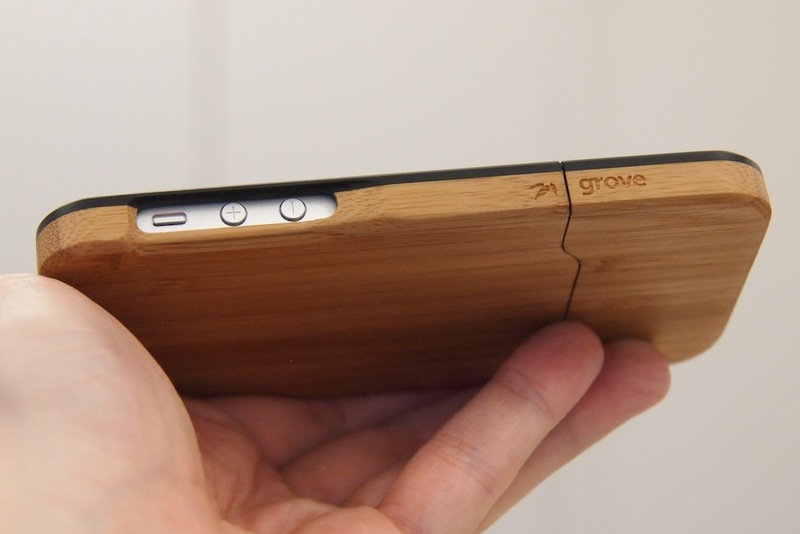 Again, at $80 (or $130 for graphical ones) apiece, the Grove iPhone 5 bamboo case is a luxury item targeted for those who don’t mind paying for uniqueness. If you have the cash, the case is a beautiful investment in a function-meets-fashion accessory – all while supporting a green cause. All Grove products are also handmade in the company’s own workshop, so remember take that into the pricing consideration. Yes, there are issues with pieces sliding apart and Lightning-to-Thunderbolt adapters, but if these aren’t problems you see yourself facing then by all means, look into the Grove bamboo case. The product is available now, with shipment dates ranging between now to end-of-year if you order today.